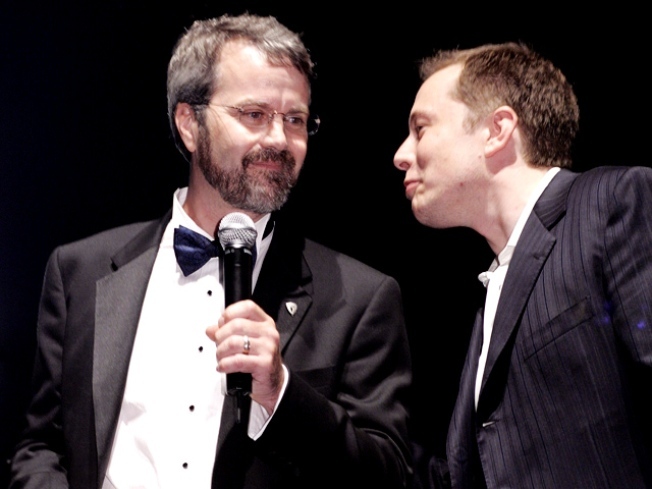 Tesla founder Martin Eberhard, left, and current CEO Elon Musk have made up after a feud. Tesla, the San Carlos, Calif.-based electric-car startup, has ended a pointless legal battle between its current and former CEOs. At issue: Whether Martin Eberhard, the company's first CEO, or Elon Musk, its current one, got to call himself "founder." Eberhard filed suit against Musk three months ago, alleging libel and slander because Musk, an early investor in Tesla, had started calling himself the company's founder. In fact, Eberhard and Marc Tarpenning are the company's actual founders. But through the settlement, Musk and two other Tesla executives get to call themselves founders, too. It's not the first time Musk has fussed about being called "founder." He started a company, X.com, which merged with another startup, Confinity. Confinity's main product was PayPal, and that became the name of the new company. In leaving PayPal, Musk went to great lengths to make sure he'd be referred to as "founder." It's all a bit silly. Look up "founder" in the dictionary and you'll find "fail utterly" and "collapse" as definitions. But in Silicon Valley, being a founder of a company, as opposed to a mere moneyman, carries considerable prestige. After all, if all it took was putting money into a company, everyone in the U.S. could consider themselves founders of Tesla, since the government has backed hundreds of millions of dollars in loans the company, like other tottering automotive enterprises, has received.